Sotelo is hardly the first modern poet to echo Greek mythology in her work, but she might be the first to reference Theseus, Kanye, and Banana Republic in the same poem ("Death Wish," page 60). She bridges academia to pop culture, straddling the division of highbrow and mainstream with skill and wit. This is the most excited I've been about a new poet in a long, long time. Selected by Ross Gay as winner of the inaugural Jake Adam York Prize, Analicia Sotelo's debut collection of poems is a vivid portrait of the artist as a young woman. 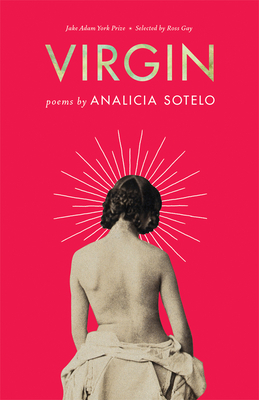 In Virgin, Sotelo walks the line between autobiography and mythmaking, offering up identities like dishes at a feast. These poems devour and complicate tropes of femininity--of naivet , of careless abandon--before sharply exploring the intelligence and fortitude of women, how "far & wide, / how dark & deep / this frigid female mind can go." A schoolgirl hopelessly in love. A daughter abandoned by her father. A seeming innocent in a cherry-red cardigan, lurking at the margins of a Texas barbeque. A contemporary Ariadne with her monstrous Theseus. A writer with a penchant for metaphor and a character who thwarts her own best efforts. "A Mexican American fascinator." At every step, Sotelo's poems seduce with history, folklore, and sensory detail--grilled meat, golden haba eros, and burnt sugar--before delivering clear-eyed and eviscerating insights into power, deceit, relationships, and ourselves. Here is what it means to love someone without truly understanding them. Here is what it means to be cruel. And here is what it means to become an artist, of words and of the self.